Being wheelchair-bound or less mobile doesn't mean you can’t enjoy exploring this great land in your accessible caravan. Getting in and out of caravans can be hard, especially for people who need special assistance – from the wheelchair-bound to those suffering from a dodgy hip or knee. But with some simple upgrades to your caravan you could be touring Australia in a way that suits you. Whether you are in a wheelchair or just find those rickety caravan steps a bit tricky, it’s good to know there are alternatives. An adjustable, foldaway ramp can be stored under the door – just fold the legs, then push it in away out of sight or for transit. Made of checker plate with rubber strips and Big Foot-fitted legs, these versatile ramps can be set up in parallel or at right angles to the caravan. Handrails are optional but available. Have a powered wheelchair lift installed on the side of your caravan. Most are driven by remote control and can be managed by one person. Wheelchair access means you’ll need a wider doorway, which is usually put in place at the time of manufacture or customisation. If you have difficulty climbing in and out of your caravan but don’t necessarily need wheelchair access, you could invest in some handrails and an extra-wide folding stepstool with grip tread that sits firmly on the ground. Once you’re inside the caravan, you’ll want to be able to move around, reach things and use the ensuite. Some modifications you might be able to do for yourself, but others will need to be custom built by the manufacturer. Arrange fittings so there’s plenty of room inside for manoeuvring a wheelchair. Replace the table with an adjustable, swivel or drop-down model that can be moved out of the way. Install a step-free, level-entry ensuite. Add fixed grab rails, drop-down seat, handheld shower and, if possible, a sliding door for easy access. Lower or raise fixtures and fittings as appropriate. Replace low-set cupboards with drawers. Install remote-controlled heating and cooling. Instead of a double bed or bunks, consider installing two single beds at right angles to give more room and easy access. 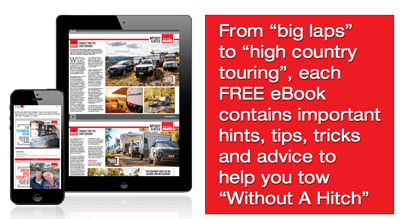 One of the best aspects of caravanning is being able to spend time outdoors, so what can be done to your caravan to make that easy for the less mobile traveller? A powered jockey wheel will do all the hard work of manoeuvring the van into the best parking spots. Hydraulic corner stabilisers or steadies will make it easy to ensure your caravan is rock-solid when parked. Install an electronic awning that extends and retracts at the press of a button to give you a second room. Invest in a slide-out barbecue and fold-down table to make a meal of outdoor cooking. Have external access built in on both sides to under-bed storage. Despite considerable demand and progress over recent years, accessibility is not universal and can’t be taken for granted. Many parks are upgrading to include wheelchair ramps, support rails, fixtures and more space in shower and laundry facilities, but it’s a slow process. When planning your trip, take the time to do plenty of research. Even if a caravan park advertises that it is ‘wheelchair accessible’, it is best to enquire directly with the park to find out exactly what facilities are available and arrange to be given a level site. Use the following websites for information on wheelchair-friendly caravan parks. Most caravan suppliers should be able to provide you with parts such as assist handles and steps, but if you want your caravan modified, Independent Living Centres publishes a list of suppliers on their website. One of the best-known is Accessavan, a Melbourne company started and owned by paraplegic Anthony Wake, to design and customise wheelchair accessible caravans. Other manufacturers such as Avida in NSW and Supreme or Evolution Caravans in Victoria will incorporate customisations on demand. Just as the range and severity of disability differs from one person to the next, how you customise your accessible caravan will vary according to your needs, lifestyle and where you want to go touring. Fortunately, technologies are constantly improving and reduced mobility should be no barrier to adventure. All the latest innovations and recreational vehicle technology will be on show at expos and exhibitions around Australia. Check our guide to find out when and where they are being held in 2015.